With a great location off I-94, just 16 miles from scenic Ann Arbor, and close to downtown Chelsea, the Baymont Inn and Suites Chelsea hotel offers easy access to businesses like Chrysler Proving Grounds, Amcor, Tenneco and Chelsea Milling Company, as well as University of Michigan, and sites like the Purple Rose Theatre Company. Chelsea Community Hospital and several restaurants are close by this lodging facility. 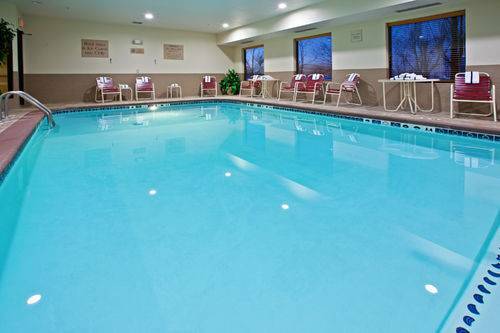 Onsite amenities include a heated indoor pool and fitness center, ample complimentary large vehicle parking, business center, meeting room, complimentary hot and cold breakfast, and complimentary wireless Internet access. Smoke-free guestrooms are outfitted with microwave, mini-fridge, and flat-screen HDTV and suites with jetted hot tub are also available. Pets are welcome for a nominal fee. - Chelsea Teddy Bear Co.
Next to a historic stone church are 14 outdoor Stations of the Cross built by two Mexican artists from 1932-1936. Wet cement was sculpted into fake wood and stone along the walkways.